I absolutely wanted to see this movie. I’ve seen the first two in the series and fell in love with the characters, enjoying the post-apocalyptic world. The young actors are incredible, it has a diverse cast and the mystery has kept me on the edge of my seat. So when the opportunity arose to review the third film, I jumped at the chance. It was well worth it, with a good plot, emotional scenes, and non-stop action. 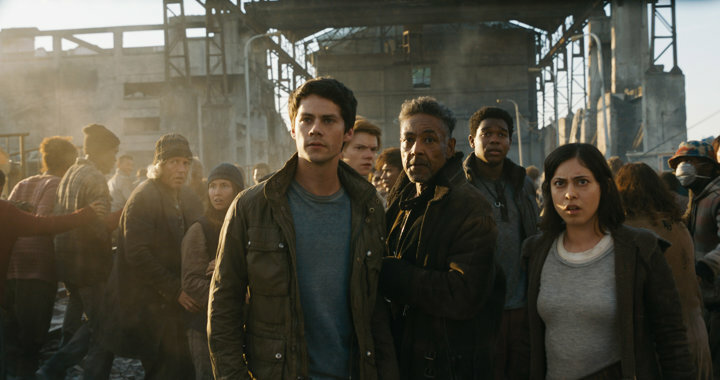 At the beginning of the film, the writers jump the viewer right into the action, leaving off with Thomas (Dylan O’Brien) attempting to find his friend Minho (Ki Hong Lee) who has been captured by WCKD. With the help of the Right Arm, months of planning come to fruition and the group manage to hijack a train and rescue a group of young people which includes some of group taken. The only problem is that Minho isn’t among them. This leads Thomas to set off on a rescue mission to the “Last City”, the stronghold of WCKD. Not only is Minho held there but it is where Teresa (Kaya Scodelario) has gone after her betrayal of the Gladers where she is working with Ava Paige (Patricia Clarkson) to find a cure for the Flare using Minho. 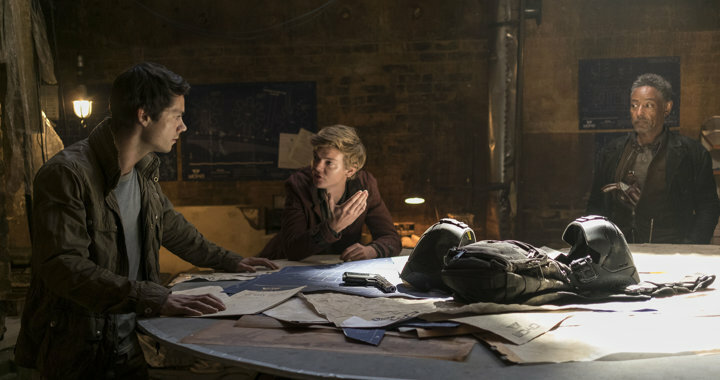 Thomas (Dylan O’Brien) and Newt (Thomas Brodie-Sangster) debate what to do, while Jorge (Giancarlo Esposito) watches. Thomas is joined by his friends Newt (Thomas Brodie-Sangster) and Frypan (Dexter Darden). When they are attacked on the road by Cranks, Brenda (Rosa Salazar), and Jorge (Giancarlo Esposito) rescue them, joining them to help get into the city. The group reaches the city but are unable to find a way in themselves, the city bristling with security and Thomas being tracked by microchip by Janson (Aidan Gillen). They join up with a group of resistance fighters, including a familiar face but the group has their own agenda. They help get Thomas and his friends in but to get to Minho, they must seek out Teresa. They must convince her to help them but Theresa has her own plans, including defeating the virus. While Thomas manages to get in, he must fight through obstacles, including Janson to escape while Theresa battles to find a cure before the plague wipes out the rest of humanity. The story does several things right. The writers don’t drag the story down with lots of backstory. They begin with action, keeping the pacing and tension high to keep me engaged. All the information you need to follow the plot from the previous movies is sprinkled into conversations and the stakes are raised naturally. I connected to the characters and was rooting for them to succeed. 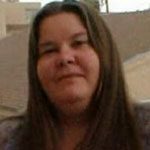 The writing also demonstrates the difficult choices in the world. WCKD might be the bad guys but they’re also the ones working on a cure. While the young protagonists are who you root for, there are characters that question the choices that they make, rescuing their friend instead of all humanity. This helps make the story more complex and engaging. The action was part of what helped catapult the movie above average. It was fast paced and there was very little down time. The action sequences were believable while the infiltration plans were well thought out. The opening scene grabs your attention and was clever. All of the fights were well choreographed and I could buy that the characters could handle themselves so well. There was only one scene that stretched my suspension of disbelief but overall, most of the scenes were realistic. In the last two movies, the characters have lost people they cared about, people the audience had a connection to and the third installment is no exception. I won’t spoil those losses but what made them resonate is that they made logical sense. They weren’t just killed off for the effect and the cause was internally consistent with the world. In addition, the actors conveyed the intense scenes with just enough pathos to wrench at your heart. I felt the pain of those losses as though they were my own. The actors are certainly part of what makes the film appealing. Dylan O’Brien as Thomas holds the story with his presence and is convincing with his conflict over working with Teresa. Kaya Scodelario is able to show that her choice to leave the others is about more than taking sides. The writers have shown the moral complexity with her choices and instead of hating her, viewers will see the logic of her actions and completely grasp the sacrifices she has made for the good of mankind. Every actor adds emotion and depth. Best of all, the adults in the film highlight the young adults performances and keep the film focused on the young protagonists. The plot is predictable. In fact, most of the twists in the story are telegraphed by preceding events. I don’t want to give the story away but I was able to figure out what was going to happen with each character. The action does keep the story moving fast enough to keep that from being too much of a factor, though. In addition, there was one surprise that I didn’t quite see coming which made up for some of the predictability. It was a solid and successful ending to the trilogy. 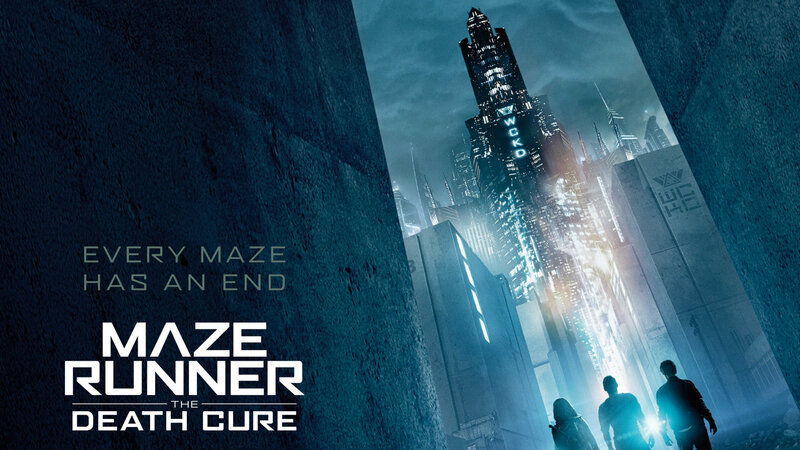 If you’ve been a fan of the Maze Runner movies, I’m sure you’ll enjoy this third film. While there is no new concepts and less mystery, it has tons of action and impassioned scenes that will keep you on the edge of your seat. The actors are excellent, the plot not dragged down by unnecessary backstory and I thoroughly enjoyed the way the conclusion ties back to the beginning of the first film. It is an emotionally satisfying ending, giving resolution with the characters and a great end to the trilogy. I’ve seen the first two in the series and fell in love with the characters, enjoying the post-apocalyptic world. The young actors are incredible, it has a diverse cast and the mystery has kept me on the edge of my seat. So when the opportunity arose to review the third film, I jumped at the chance. It was well worth it, with a good plot, emotional scenes, and non-stop action.